When our family decided to stay at a farm in rural New Hampshire as part of our New England vacation, I immediately took to the internet to research the area around Newport, NH where we’d be staying. Among the historic buildings and covered bridges, one listing caught my attention: Blueberry picking! Whatever else we did, I knew this topped my list of options for a family activity. Blueberries are my all-time favorite fruit. In fact, at my former job at the American Heart Association’s Children’s Museum, every employee’s name tag stated their favorite fruit or vegetable under their name, so mine said “Sarah Blueberries”–which always led kids on my tours to ask if “Blueberries” was my last name. I wish! Wouldn’t that be perfect for a nutritionist? Maybe I can convince my husband we should consider a name change. As fruits (and foods in general) go, you can’t get much healthier than blueberries. They’re packed with antioxidants, vitamins K and C, and contain a surprisingly high amount of fiber. (Check out this post of mine over on Brit + Co to read more about berry health benefits!) I also find them super versatile and delicious–as you may have realized from the many blueberry recipes on this blog! Bartlett’s Blueberry Farm came highly recommended by the owners of the farm where we were staying, and it happened to be the closest place to pick blueberries, so we set off on our outing on a beautiful sunny day. Upon our arrival, we were greeted by the lovely lady who runs the farm at a tented stand featuring tons of blueberry-based products. 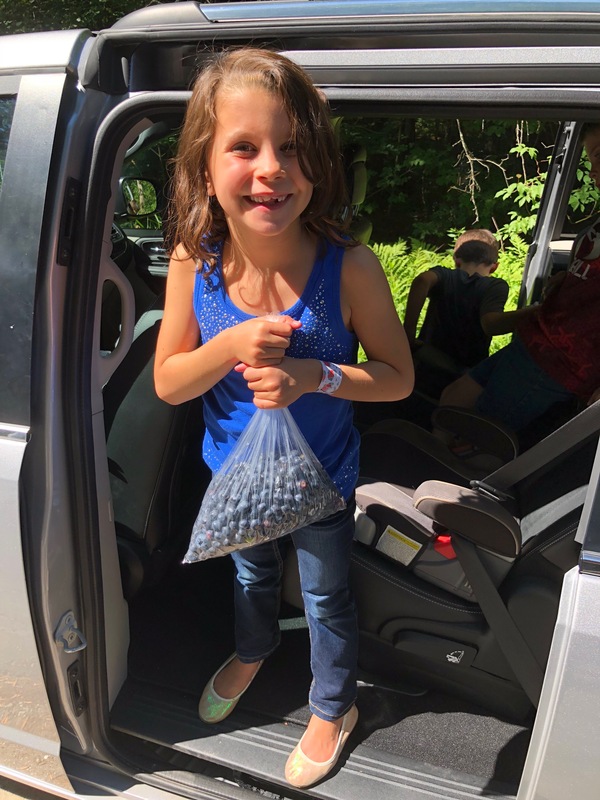 The owner explained that we had access to the farm’s enormous swath of blueberry bushes, with our choice of picking to fill either a large bucket or smaller buckets. Since our stay in New Hampshire would be brief, we chose the smaller buckets, which adorably (and conveniently) hung on strings around our necks while picking. With that, we were off to picking! Embarrassingly, before this experience, I couldn’t have told you what a blueberry bush even looked like. They’re not exactly springing up on every corner in Phoenix, where I’ve lived almost my entire life. Actually, I’ve only ever known one person who succeeded in making them grow in the desert, and he was a horticulturist. So I was pleased to learn that blueberries grow in bunches on pretty, thorn-less, eye-level bushes. 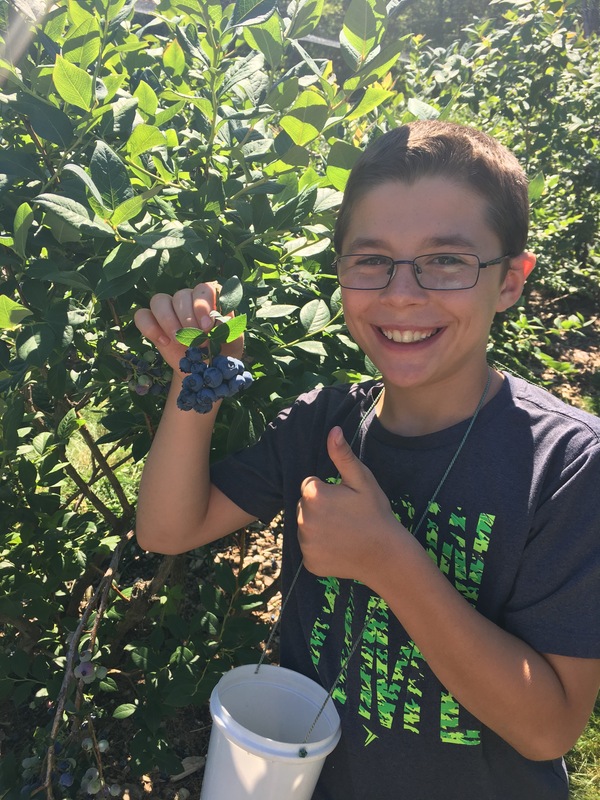 Bartlett’s Farm boasted several varieties of blueberries. At the end of each row was a marker designating its variety, such as Duke, Nelson, and Earlibue. We tasted several and did notice a difference–some were sweeter, some tarter. To me, blueberries have always just been blueberries, so it was interesting to learn that there are subtle differences between different plants. Picking the blueberries proved to be a very simple task (not nearly as arduous as apple picking, with all the reaching and pulling and spiky lacrosse stick-like plucking tools). With plenty of ripe berries in easy reach and no thorns to poke us, the berries practically fell off the branches into our buckets. We all just kept our eyes peeled for the bluest fruits, knowing they’d be sweetest, and avoided any green or magenta-colored ones. Sometimes they even popped off in perfect little clusters, like this..
All in all, we probably spent 45 minutes picking before we got our fill (well, more than our fill) of blueberries. I don’t actually recall the price per pound, but I do know that for the amount pictured–I’m guessing at least two pounds–we paid only $6.60. A pretty stellar deal for fresh, local blueberries, even if we picked them ourselves. 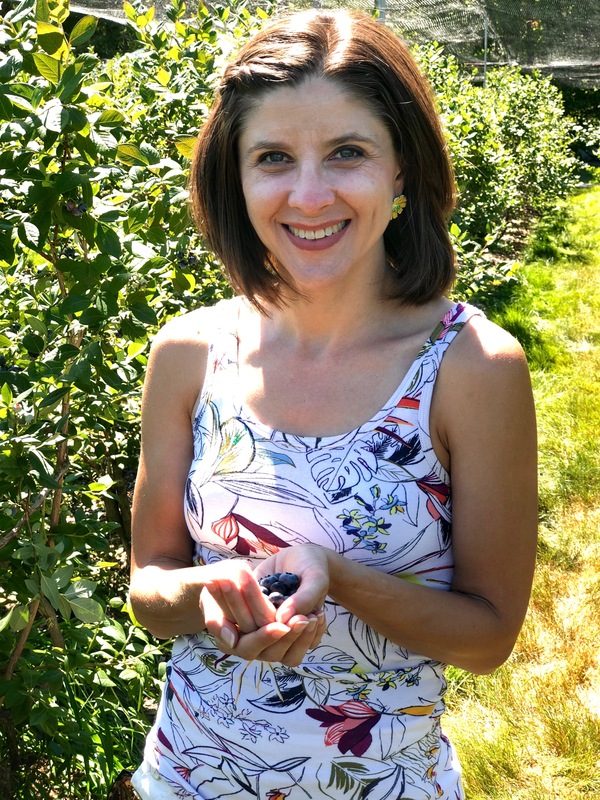 If you’re ever in western New Hampshire, check out Bartlett’s Blueberry Farm! Lots of fun. Much better than I expected. It was $2.99/lb. plus a donation for all the eating you do while picking. 🙂 they called it the “sin bin” and they raised $2000 for charity last year with it.